I have this stroller for Haiden and Piper and I think it's great; It folds up to the size of a folded single stroller! 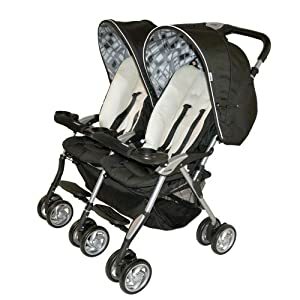 Right now you can get the Combi Twin Sport Side by Side double stroller in Sand (black) for $165. 80. That's 34% off the list price of $250! Shipping and returns are free on this item. Do you like how it maneuvers? I got a double jogging stroller because its so much easier to push and maneuver so I’m afraid of going to one of the more compact doubles.